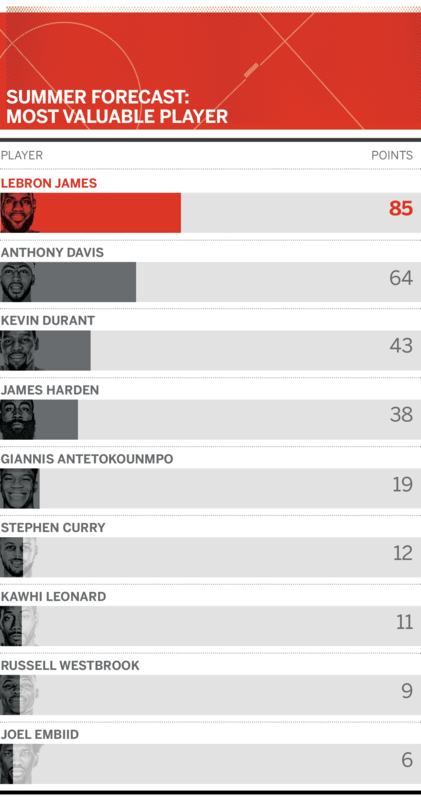 We asked the ESPN Forecast panel to rank its top three choices for the 2018-19 NBA MVP. Despite being widely considered the best basketball player in the world, LeBron hasn't won an MVP award since the 2012-13 season. But what if James and the Lakers surprise everyone and make a run to a top-four seed in the Western Conference? James would have a compelling narrative in leading the NBA's glamour franchise back to the playoffs after a six-year drought. Harden won his first MVP award last season, capping his third top-two finish in the voting in the past four seasons. He led the Rockets to the best record in the NBA and, perhaps, was one Chris Paul hamstring injury away from the NBA Finals. Despite that, the Warriors will enter this season as massive favorites to win the championship again. Antetokounmpo is coming off a magical season in which he averaged 26.9 points (52.9 percent shooting from the field, 76.0 percent on free throws), 10.0 rebounds, 4.8 assists, 1.5 steals and 1.4 blocked shots, leading the Bucks to the playoffs and finishing sixth in the MVP voting. Leonard finished in the top three in the MVP vote in 2015-16 and 2016-17, before his well-publicized quad injury forced him to miss all but nine games last season. Meanwhile, the Raptors quietly turned in the second-best regular-season record in the NBA last season with 59 wins.